Many who are in IT/Telco industry use something similar. How about using those (invertor part inside in particular) with extra designed and built charging curcuit to utilise Li-Ion batteries instead of AGM? 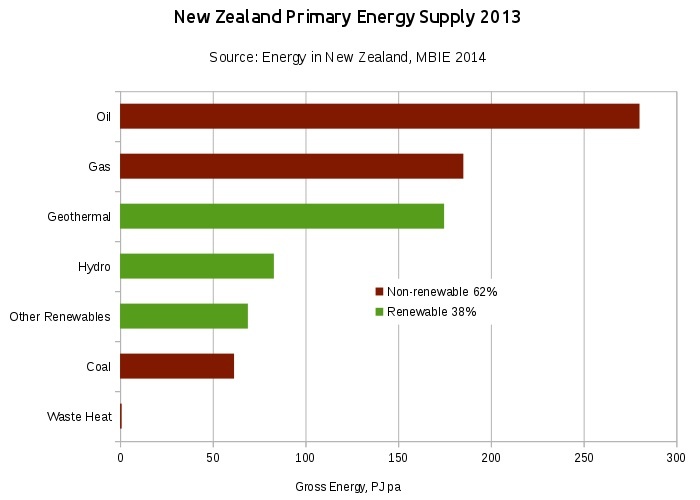 And domestic solar in NZ makes little sense from an environmental point of view. As most generation is already renewable. For the point of this conversation, Geothermal is somewhat misleading in that graph, in that it measures gross energy, rather than its transformed and usable 'output' energy. With a thermal efficiency rate of only 7-15% (due to working fluid temperatures that are much lower than oil/gas/coal power stations) the energy output of Geothermal is therefore more like 10 PJ pa, or approximately a quarter of Hydro's output. By comparison, Hydro's mechanical efficiency is above 90%, while the thermal efficiency of newer CCGT (gas) power stations is upward of 50%. First Australian installs happening now. Still waiting for Vector to return me the contract [signed by them]. The only person who was in charge in Solar Team (Panels + Tesla Battery) has left and they said they are about to replace that position. Called few times - contact centre unable to comment. My emails asking about the status of the contract I've signed have not being returned. A lot of people are keen and I have nothing to tell them yet :-( . Will wait and see. Will keep you posted.